What’s the first priority when booking a trip to New York? 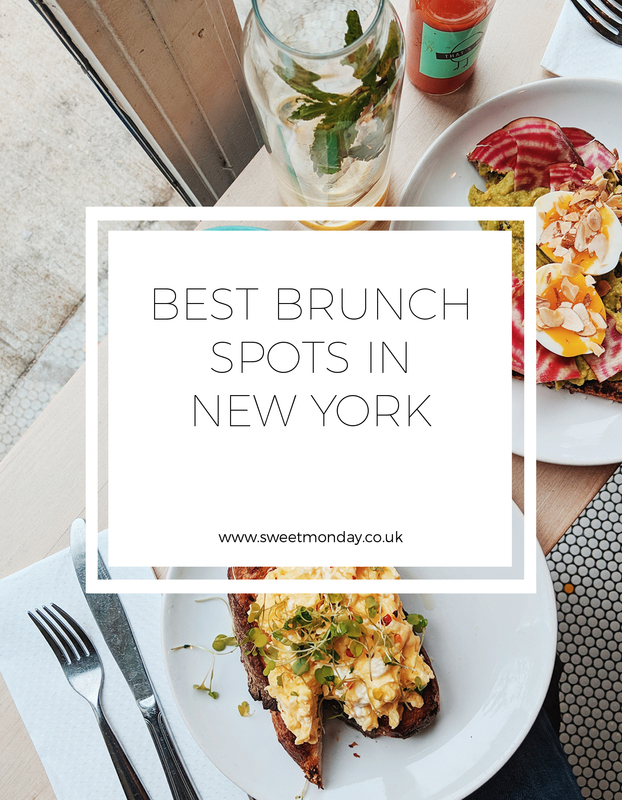 Looking for the best brunch spots of course! If you’re a foodie like me, I hope at least some of my recommendations make your list. Brunch in NYC is fantastic! There are so many places to choose from. There’s literally hundreds, if not thousands, of cafes and coffee shops. 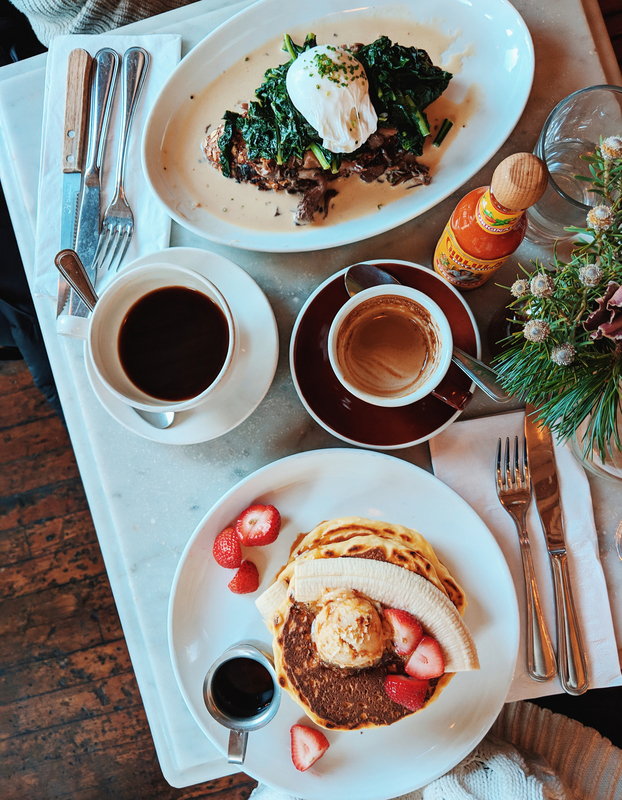 Whilst most breakfast spots serve the classic American style breakfast – pancakes, bacon, eggs whichever way you want them etc. There are a few gems that dish up healthier brunch menus, with gorgeous interiors, local produce and friendly staff. 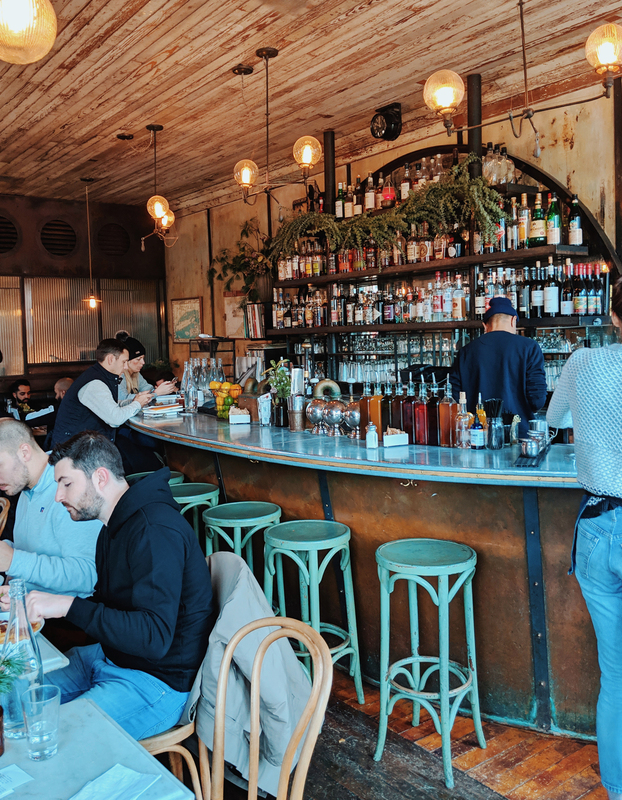 There are three of these cafes in the city – Williamsburg, West Village and Little Italy. 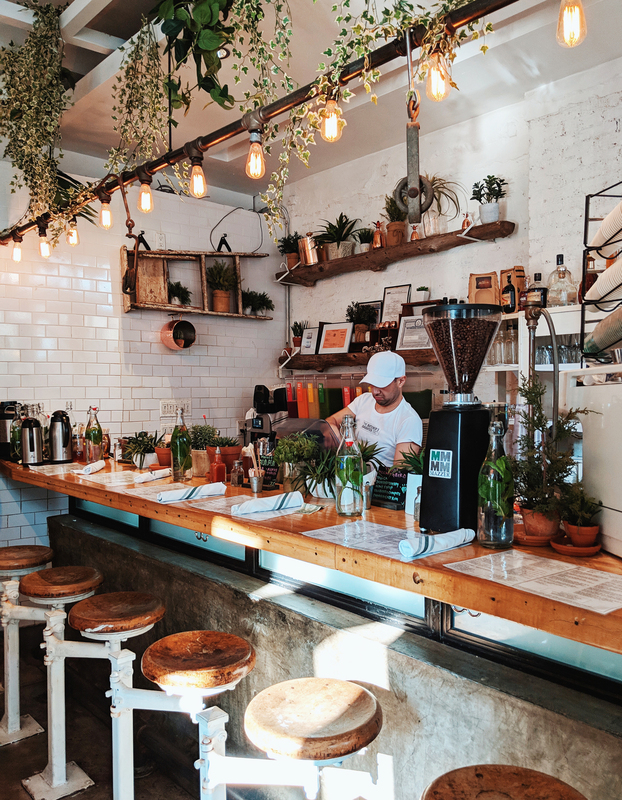 Each one is home to the most beautiful interiors, with hanging plants, white tiles, exposed brick work, and communal reclaimed wood tables. The Daughter is Heather Tierney, who has a passion for healthy breakfasts and great juices. She also has a keen eye for interior design, and has designed all three locations. 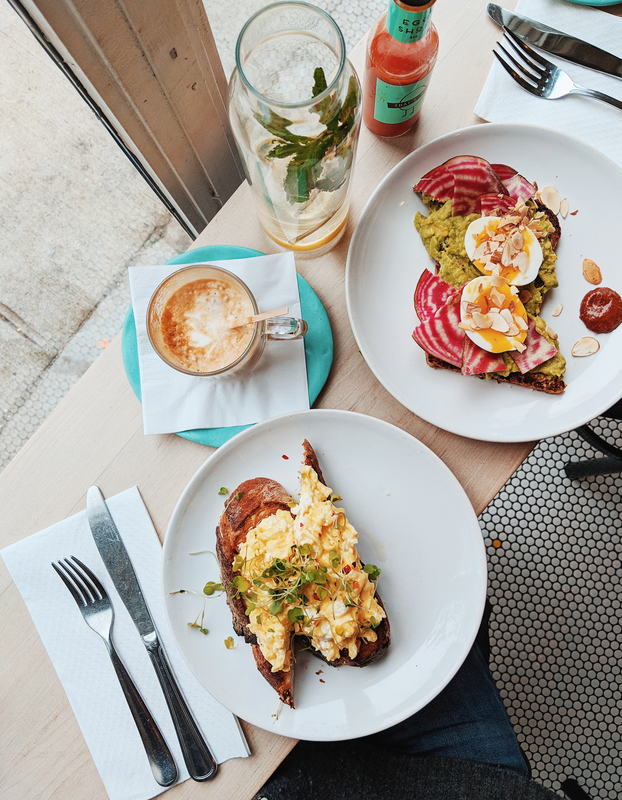 Their menus boasts classics such as Smashed Avocado Toast, Pancakes and Omelette’s, but some dishes take a twist with Pomegranate Porridge and Breakfast Tacos. 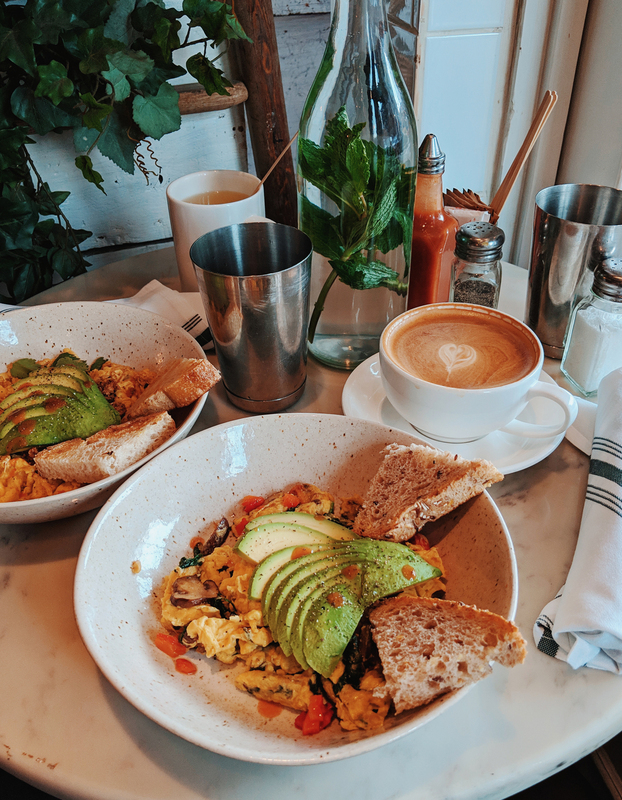 Pictured above is Spinach Egg Bowl and Mexican Breakfast Bowl. Both absolutely delicious, but perhaps a little small considering the $14 price tag. Although, that’s probably about fair in New York, where nothing is cheap. That being said, I was hoping for a bit more in my bowl, but that didn’t take away from the delicious flavours and pretty decor (pictured below) to take a break. 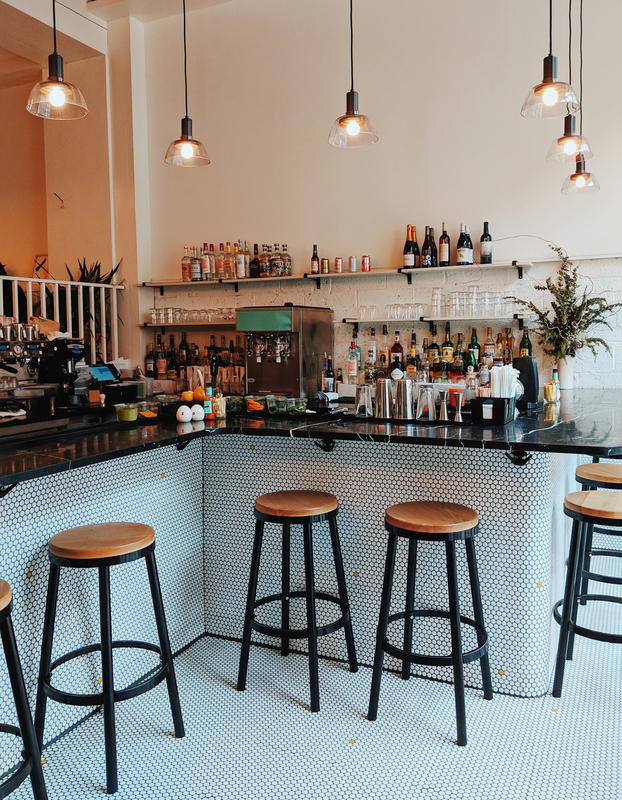 Based in Williamsburg, Five Leaves needs to be on your list! As should Williamsburg anyway, if you read my previous post 10 Things to do in New York. Williamsburg is a cool and trendy area of the city, with some of the best foodie spots. Five Leaves came highly recommended and it didn’t disappoint. I was worried we wouldn’t get a table, with others saying they queued outside. But luckily it was fairly quiet on a Monday morning. Again, the interiors of this place got me. It’s teeny tiny inside, but the bar and seating area is beautiful. They’ve done a great job with the space, and in the summer there are tables outside which I’m sure would be lovely. Here the dishes are the size you’d expect for America. Not huge, but sizeable, and plenty for both of us. We were both drawn to the Mushroom Toast (pictured above) but everyone had told us to try the pancakes. I’m not a huge pancake fan (shock, I know), but we tried them and I’m SO glad we did! They were wonderfully fluffy, not overly filling, and came topped with honeycomb butter (yes, that’s a thing!! ), banana, strawberries and pure maple syrup (also pictured above). 100% add this gem to your itinerary! I’m sure you’ve all seen this one on Instagram at some point. 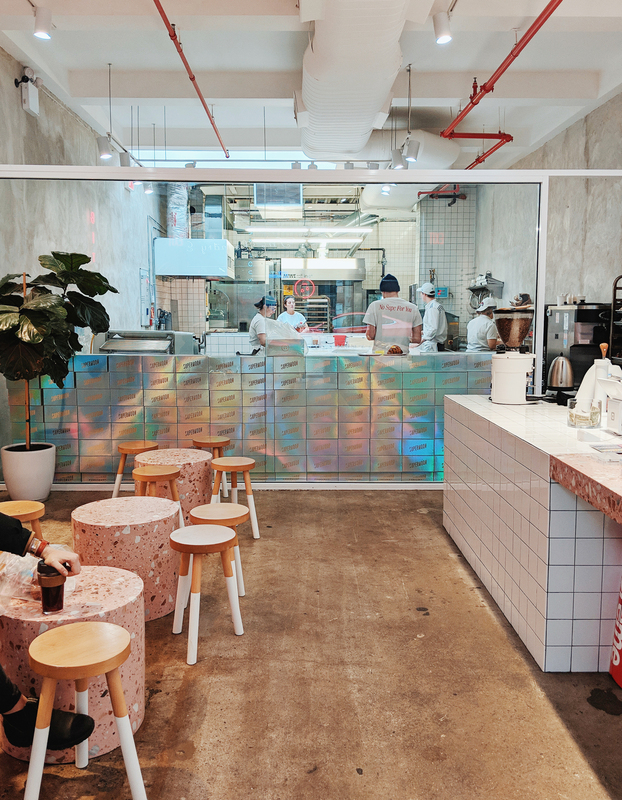 With multiple locations all over the city, Egg Shop is an IG favourite. Whilst being super trendy, with minimal decor, they’ve absolutely nailed their menu and their branding! Their Tiffany turquoise runs throughout their cafes, complimenting their dishes for that perfect IG shot. If you’re not all about Instagram, you’ll be pleased to know their food also lives up to the hype! The menu is nothing out of the ordinary, but with dishes names Fish Out of Water, Hot Chix and Spandex, you’ll need to take a double take. I opted for scrambled eggs on toast, with a hint of truffle. This could’ve been disastrous as scrambled eggs often leave me feeling a bit yuck afterwards, especially when combined with truffle oil. BUT thankfully there was just the right amount of truffle for it to not be over powering, and the scrambled eggs were beautiful. My boyfriend chose the Avo & Egg, which came with soft boiled eggs, tahini, watermelon radish, harissa and almonds. I hate to admit, as much as I liked my dish, his won. I have followed Supermoon Bakehouse on Instagram for as long as I can remember. I have been hypnotised by their pastry making skills, and have saved countless photos of their colourful croissants pre-bake. Honestly, their Instagram account is GOALS, and I couldn’t not visit New York and not stop by. Located in the Lower East Side, a stop here also meant that we were able to see a different area of the city again. The architecture around here is very different and it’s a cool place to shop, hangout, go for drinks. Their store is like an art gallery. It’s fully concrete, with each pastry on the menu that day, carefully placed on a bar for your inspection, before heading to the till to make your order. The kitchen is separated by a glass wall, so you’re able to see their master pastry chefs at work. You’ll want to have a sneak peak, as it’s really very magical! 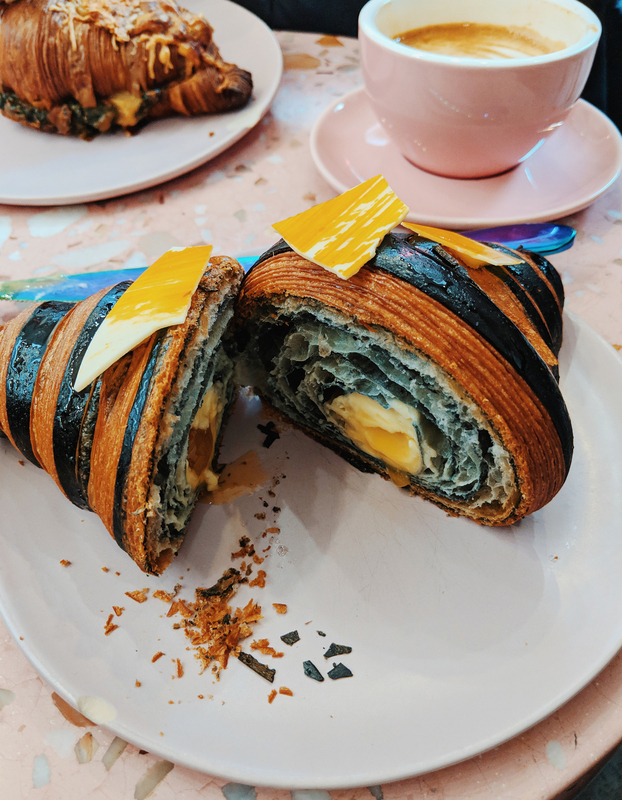 We chose a cheese and spinach, double bake croissant to start, and a black pepper and lemon sweet one to finish. Both were exquisite. We honestly couldn’t fault them. The coffee was rather delicious too. 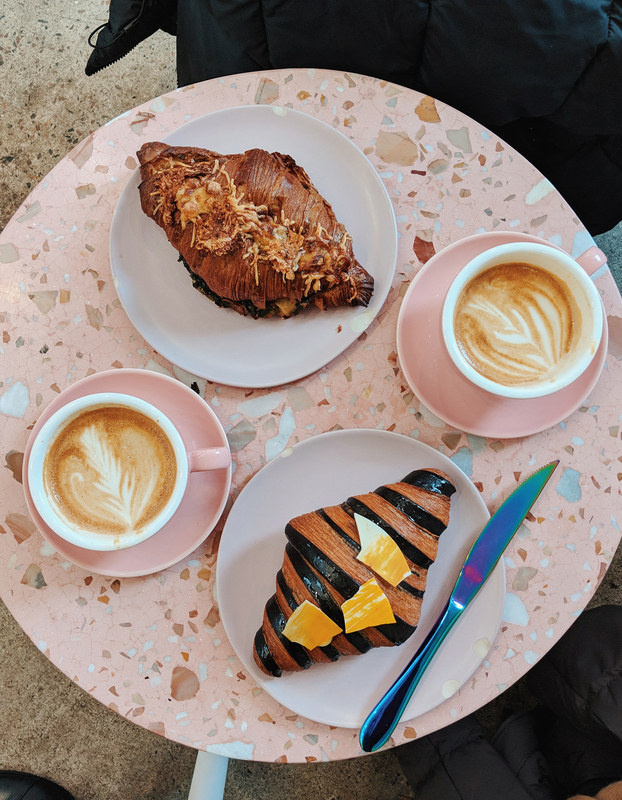 Definitely one to add to your list if you’re partial to a pastry and want to try the best croissant of your life… Yep, I said it! Finally, Russ & Daughters. Sadly we didn’t get to eat here as the queue was over and hour and stupidly we left it until the last day when we were in a bit of a rush. But I still wanted to include it as I’ve heard so many good things. I’m gutted we didn’t have time to try it for ourselves. Also located in the Lower East Side, they have a cafe (which is quite hard to find) and a deli just up the street. We did stop in the deli which is an experience in itself, but the cafe looked great. I definitely want to give it another shot if we visit again. It literally has the accolade ‘one of the 10 best restaurants in New York’ by the New York Times! After operating their deli for over 100 years, in 2014 they made the decision to open a cafe, and they haven’t looked back since! They have queues all day every day, with hundreds of people flocking to try their menu. The menu is all seafood with cured salmon, salmon roe, kippered salmon, smoked white fish and herring. The menu is vast but perfectly curated. There’s something for everyone, as long as you like fish! I hope you’ve enjoyed my recommendations, and if you have any others that I’ve missed, I’d love to hear them!